Hi Stamp AnnieThing friends and followers! 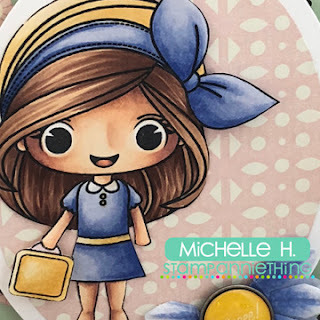 Michelle Houghton here sharing some Stamp AnnieThing inspiration and a little Copic know how with you today! Ann has asked that once or twice a month I give a few techniques with Copics on her amazing stamps and so that is the plan! Today I have the second part of coloring this adorable Diana-Let's Do Lunch image. If you missed it, last month I was coloring her hair, today I am coloring her skin. Lot's of people ask if there is a "right way" to color with Copics and my honest answer is there are some ways to color that make you more successful and some tricks to avoid messes. But most people over time adapt how they are coloring to what works best for them. Watch a lot of tutorials, try a lot of techniques and make it work for you. On Diana I show you how to color her skin 2 ways working from light to dark with is very traditional from Copic manufacturers. It tends to be how we start beginners, you tend to have an easier time blending and see the magic of Copics quicker. The second portion of the video shows coloring working from dark to light. Several people shift to this Copic coloring technique after they have been coloring for a while and some start right off the bat with this, as much as anything because the blending happens as you add each color and they like starting with the darkest shadow areas and mapping those in first. I promise I will not always be this verbose in my posts. You can watch the video and figure it out and always make sure to ask questions, happy to answer! In the mean time here is how Diana ended up on her card! One of the details I love about this little stamp is her hair, for fun I changed the area above her headband to look like a hat, but you can also color that as her her with a headband always fun to make a stamp work more then one way! Lastly here is a link to the adorable Diana - Let's Do Lunch! Thanks for stopping by today! Make sure to come back for more Stamp AnnieThing inspiration! Have a Happy Colorful Day! magnifique colorisation, carte trop jolie, merci pour cette vidéo instructive!